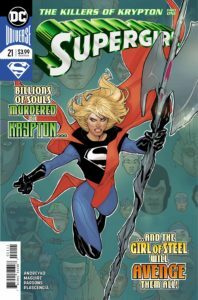 Corinne talks Supergirl with the Kryptonian's new writer, Marc Andreyko. What does he have in store for her and what does Cori think of issue #21? When Supergirl went on hiatus back in April, I was very disappointed. 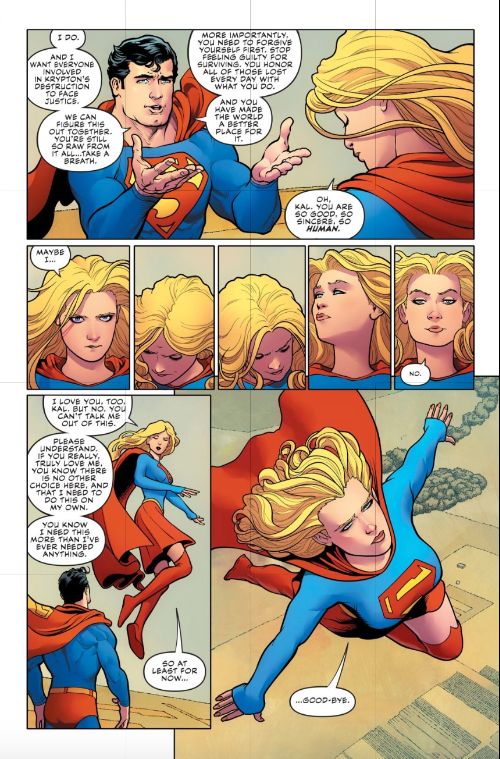 Steve Orlando and his collaborators (notably Brian Ching and Robson Rocha) had told one heck of a Supergirl story, and I was sad to see them leaving the book. I also had my fears about the book coming back at all, since with the ending coinciding with Brian Michael Bendis taking over the Superman books, it looked like he might be hitting reset on some things, possibly like Byrne before him. So when Marc Andreyko and Kevin Maguire were revealed to be taking over the book (without renumbering—maybe there’s a lesson to be learned there, Marvel), I was very happy to know that my favorite character wasn’t going away again. At San Diego Comic-Con, I was given the opportunity to sit down with Marc for a bit and talk to him about what’s coming for his run ahead of this week’s release of the issue. How big of a fan were you of the character before coming on to Supergirl? I knew the character well, because I’ve been reading comics since I was four years old. I loved her in the Legion of Super-Heroes when Paul Levitz and Keith Giffen were doing it. And I loved what Marv Wolfman did with her in Crisis on Infinite Earths. What’s been interesting, though, is she has been a bit of cypher; what is the ultimate Supergirl story? Sterling Gates’ run is mine. Sterling and Jamal’s stuff was great. She’s been through so much turmoil, especially Post-Crisis when she was protoplasm and then she was a suicidal angel and then she was raised on Apokalips. There’s been a lot of trying to find out who she is. And the inroad for me was, when talking to Bendis about what he’s doing with Superman, unlike Clark, who was a baby and doesn’t remember Krypton, she was a teenager and everyone she knows died. She has never dealt with that and I’m using that to explain why she’s been rather ambiguous with her identity over the years and why there’s so many different versions of her. So it’s going to be her exploring, going on this physical journey into space to figure out who else knew about what happened to Krypton. But it’s also mirroring the emotional journey of her figuring out who she is and who she wants to be and where she fits in and dealing with a little of her survivor’s guilt. That being said, it’s not a dark depressing story, it’s not an emo book, it’s not Nine Inch Nails with Supergirl. It’s definitely going to be a big fun rollicking space adventure. Krypto is a big part of it, and we’re going to see characters we haven’t seen in years. But it needs to have real emotional truth to it. By the end of it she’s going to know who she is and where she fits in the universe and have some peace. 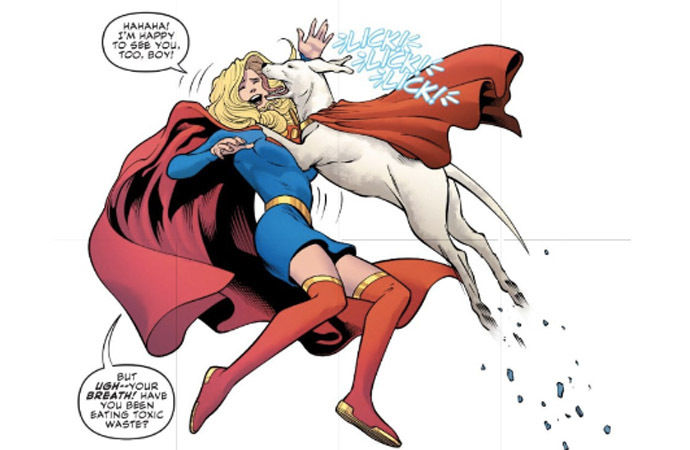 You brought up Krypto, any chance we’ll see her other pets? Not in the immediate future. Do you have a favorite Supergirl story? I loved the relationship she had with Brainiac 5, in the Paul Levitz and Keith Giffen Legion, and I think Crisis on Infinite Earths probably—even though she is a character in a cast of thousands, that issue seven, that to me, encapsulates who she is, and using not the specifics of that, but the core of that sacrifice and that hidden reservoir of pain makes her a real fascinating character. She’s also held up to her cousin, who is the superhero, so there’s that too. There’s the whole “Marsha, Marsha, Marsha” of it all. On Earth, she’s quantified as Superman’s Cousin. And she’s actually older than him, you know. So there’s all sorts of her getting out of her own way that I think resonates with all of us as we get older and become adults. It’s about finding a center for herself and making her the vibrant, dynamic character I think she’s always had the potential to be, but we’ve been skirting around for the past twenty or so years. Your story is a cosmic space adventure. Aside from the Green Lanterns, are we going to see any special guests, like maybe the Legion? Not the Legion no, but definitely some other cosmic characters. Legion is off the table. There’ll be some sci-fi characters from the DC Universe we haven’t seen in a while, and some surprising ones and some fun ones, and some new characters will be introduced. I’m probably not going to reference her time as a Red Lantern at all. I’m not going to undo any of that, and I’m not even sure that that exists in the post-Rebirth timeline. I think with Grant taking over The Green Lantern that the multi-colored Lanterns are going to be off the main stage for a little while. Supergirl’s costume since Rebirth has been very similar to the TV show costume, is there a reason for the change to the new looks? Most of that was Jorge’s stuff. And she’s not completely changing her costume, that’s a functional costume for space travel and all that entails. She’ll be wearing her regular costume a lot. There’s a reason and a purpose behind that costume, and that costume can change as well. And the new main suit looks like an homage to the Silver Age costume with the blue skirt instead of the red skirt. I don’t know if that’s true. She’s got a red skirt. In the book she’ll be back in her red skirt. I’ll have to talk to the colorist before the issue goes to print. By the end of your run, are you bringing her back to Earth? Or is she still going to be exploring? You’ll have to read! Eventually she’ll come back to Earth. I mean she has to! But you’ll see, you’ll see. It’s all part of a bigger plan. Coming away from the interview, I still had my hesitations about where this story was going. I definitely don’t want to see yet another anger- and vengeance-driven Supergirl; I got enough of that from Jeph Loeb, Joe Kelly, and her time as a Red Lantern. I do think that there are plenty of stories where she has effectively dealt with the traumas she’s endured, most notably in Sterling Gates and Jamal Igle’s New Krypton work, where she dealt with losing her parents a second time. The entire Bizarrogirl arc is about that grief and finding her place. While I’m a huge Pre-Crisis Kara fan, with the Bronze Age Kara being my absolute favorite, I think it’s doing some great creators a disservice to say she’s been avoiding her potential for the last twenty years—I don’t think we’d have a hit TV show going into its fourth season otherwise. After all, at the height of her popularity in the Bronze Age, we got one movie that bombed and then no Kara Zor-El for the next twenty years. That said, I put aside my reservations and read the first issue, and all in all, I really enjoyed it. There are definite moments of anger, but they are interspersed with moments of sheer grief and moments of unadulterated joy. There’s a moment in the middle of the book where she has an earnest heart-to-heart conversation with Kal, and it’s beautifully written and drawn. Maguire is able to capture the inner turmoil Kara is going through perfectly. 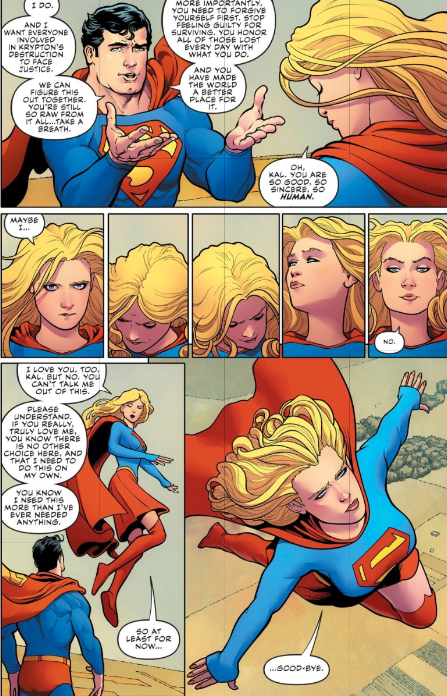 And to me that page represents something more: it represents what the Supergirl/Superman relationship is more than the “Marsha, Marsha, Marsha” complex Marc talked about. To me, Supergirl isn’t jealous of her cousin, she doesn’t want to be seen as good as him—she just wants to make him proud of her. That’s something Crisis on Infinite Earths encapsulated so well for me. She does indeed don a new pure blue suit, and it does indeed serve a purpose, with the House of El crest acting as a solar collector (and glowing) for those times when she will be away from a yellow sun on her mission. 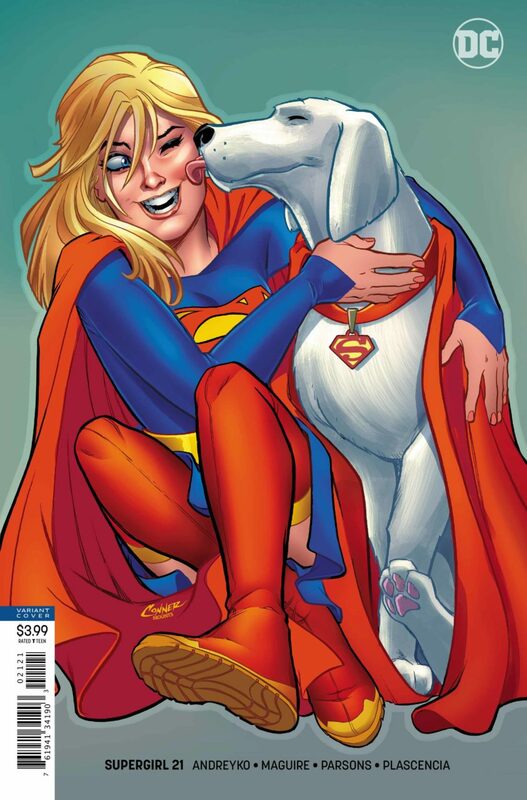 The highlight of the issue though, is Kevin Maguire’s Krypto. 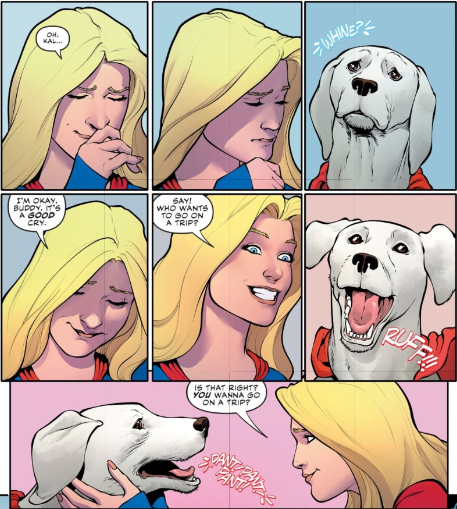 Kal sends him along to get some peace of mind, and to give Kara some companionship, and there’s a gorgeous sequence where Kara starts crying, and Krypto gets sad and then immediately goes back to excited as she offers to take him on a space trip. Kevin draws the absolute bestest boy, and I am here for it for this entire run. This first issue was good enough that I’m excited for what comes next, even if I still have some reservations. It seems like Marc does have a good plan for where he wants to take the character, even if some of his answers left me a little leery of what’s coming. But I suppose that’s what a good writer will do, because where’s the suspense if you know everything is going to be perfectly fine? As Marc said, I guess I’ll see what this bigger plan is.